1. Prepare the cooking pan, add coconut milk, ginger, garlic, onion, and salt. Stir until boiled. 2. Pour pork simmer until tender. Add more coconut milk when necessary. 3. 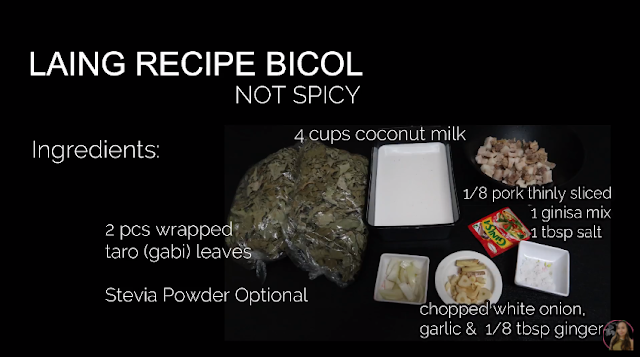 Pour shredded taro (Gabi) leaves, mix up once only then let it cook. 4. To become tasty, add Ginisa Mix, 1 stick stevia then mix up. Tip: Do not stir well so itchiness of the taro will not appear on the dish.